A chemical peel that is done by a medical aesthetician in a medical spa under physician supervision is a light or superficial chemical peel that exfoliates the facial skin and stimulates new collagen production in the skin to remove aging changes. Superficial, gentle, or mild facial chemical peels use dilute glycolic acid, lactic acid, or salicylic acid, to produce a superficial chemical skin peel for exfoliation and collagen stimulation but require little recovery time and minimal risk of side effects. A mild dilute chemical peel solution is applied to the facial skin. Sometimes dermaplaning or mechanical exfoliation is done prior to the application of the chemical peel solution. The peel solution is left on the face to allow it to work and during this time you may feel tingling of the facial skin. Once the chemical peel solution has had a chance to work it is neutralized and the face cleansed and washed. Is face skin peeling safe? Superficial or light glycolic acid, lactic acid or salicylic acid peels done in a medical spa by medical aesthetician under physician supervision should be safe procedures. Deep phenol, TCA or trichloroacetic acid peels are serious surgical procedures that should only be done by a physician and never done by a medical aesthetician in a medical spa environment. Who should do my face chemical peel? Superficial or light glycolic acid, lactic acid or salicylic acid face peels can be done by a trained nurse, PA or medical aesthetician in a medical spa which is supervised by a physician. Deep phenol or TCA should only be done by a physician in a proper surgical environment. How will I look after a chemical peel? Your face may be pink after a superficial lactic acid, glycolic acid, or salicylic acid peel. Over the next 24-48 hours you may notice some peeling or flaking of dry, aged damaged skin. You should be able to apply makeup right after most superficial chemical peels. How long is recovery after a chemical peel? Recovery from a superficial face chemical peel is usually not significant and consists of pink skin color immediately after the peel and possibly some dry flaking skin over the next 2-3 days. When will I see the final result of my chemical face peel? You will see improvement in your facial skin in a few days but the benefits of new skin formation and new collagen formation take time to occur. New collagen production does not start for 6 weeks. Therefore the benefits of your chemical peel will continue and the full benefits are seen at 3-6 months. This newest gentle chemical peel made by Mybody® utilizes probiotic derived bioactives (PDBs) that stimulate skin rejuvenation and new collagen synthesis. Please call us at 617-455-2859 to learn more. 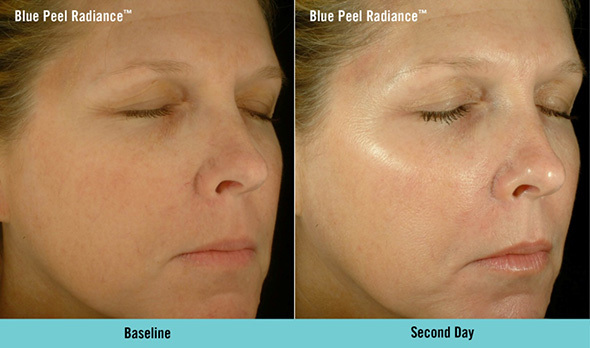 The Obagi® Blue Peel is a diluted 15% TCA or trichloroacetic acid peel used to remove wrinkles and sun spots. The peel solution is blue to assure even application. One to 4 layers may be applied. There is a slight tingling sensation that is cooled with a fan and no anesthesia is required. Your skin will peel after 2-3 days and new, smoother skin will appear. Sun avoidance before and after is very important as is stopping RetinA® and sun exposure two weeks before. If you are looking for a non-surgical cosmetic treatment that can rejuvenate your appearance, chemical peels may be for you. Dr. Brooke Seckel is a plastic surgeon in Boston patients trust to provide safe, effective treatments and beautiful, natural results. Call 617-455-2859 today to schedule a consultation. During your appointment, you can learn about the many medical spa treatments available, including microdermabrasion, acne treatment, and Photo Facial IPL.